So, last fall I got to take a fun class at Beaded Bliss from Brenda Meyers (You may remember her from this post about a certain gorgeous painted rose.) 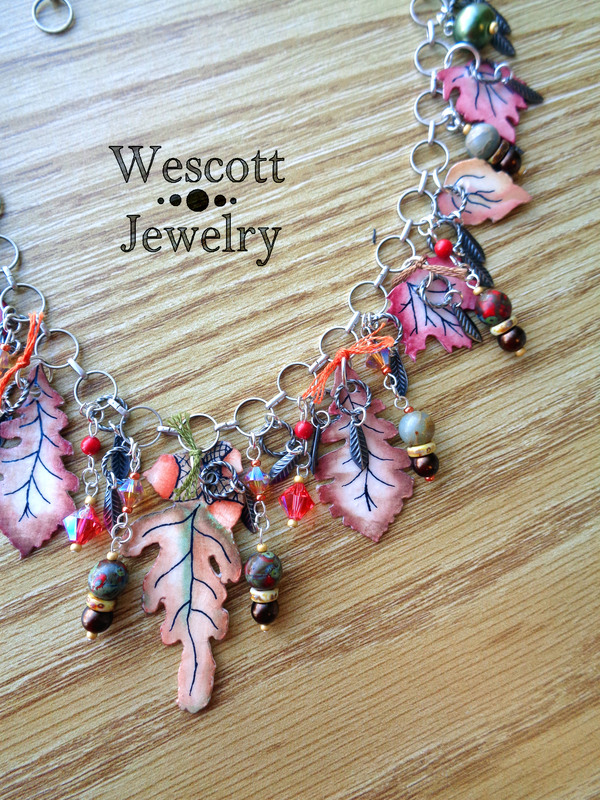 The class was on using watercolors to paint leaves on heavy paper to make a gorgeous necklace like this! I took the class and OH MY GOD, you guys, painting is REALLY hard! Watercolors are a mess of water-bending and pigment-focused telepathy. If you give your paint brush so much as a funny look, paint will end up in your hair and down your cleavage and, my friends, I have never been so bested by painting supplies. Watercolors are temperamental. And I’m pretty sure they distinctly disliked me. I had so much fun, though. I got to make a whole bunch of leaves and then we did line work to fill out the details and covered them in what was maybe modge podge to make them stiff and preserve the paint. I took them home, let them dry… and then forgot about them. I am so bad at things. So, I was cleaning off my table last month and found a little container that I had completely forgotten about. It was full of my little painted leaves. So, I made this. My painting is still a bit amateur, but I really enjoyed putting this necklace together. I decided to opt for silver chain, because copper and bronze are my go-to metals and I thought using silver for a fall necklace would be a fun challenge. 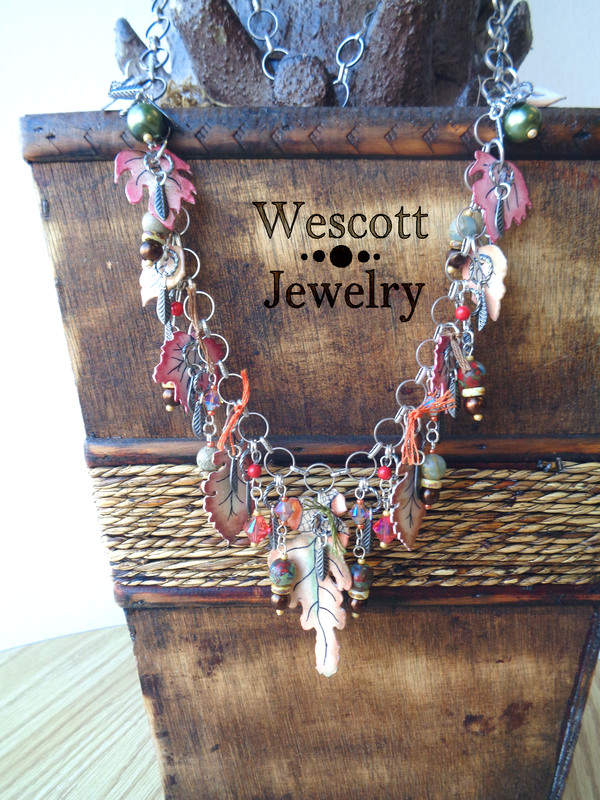 I used twisted jump rings and little silver leaves to add some texture and then a mess of Czech glass beads in earth tones and Swarovski crystals in bright padparadscha and topaz AB. Brenda also provided little yarn scraps, so I tied that in here and there. I made it extra long so that it would fit over sweaters this fall and winter. And when it’s worn long, the leaves tend to jumble in and have a wonderful, jumping-in-to-a-pile-of-leaves feel to it. It was a really, really fun project and took me completely out of my comfort zone. Incorporating watercolors into my jewelry would never have occurred to me and I’m so glad I got to experiment with something fun. If you’re near the Cincinnati/Southern Indiana area, Brenda is teaching this class at Beaded Bliss this Saturday (November 12th, 2016), in the afternoon. You can read the details here. I had a really good time last year and highly recommend it. But… if you take the class, maybe don’t take a whole year to make the necklace. This entry was posted in Beading Techniques and Experiments, Storytime and tagged bead shops, beading, beading classes, beads, blogging, classes, crafting, crafts, diy, jewelry making, making jewelry, necklaces, painting, watercolors. Bookmark the permalink.